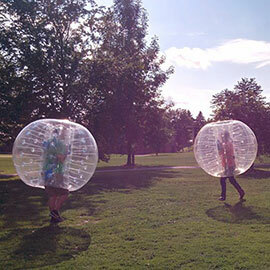 About a year ago, Laurier students Mandy Gu and Edward Qian started GeeseRabbit, a business that rents out inflatable “zorbs” – giant, transparent bubbles that fit from above users’ heads to just above their knees – used to play sports such as soccer. Gu and Qian got the idea for GeeseRabbit after watching a viral bubble soccer video. Seeing an apt business opportunity, they purchased some zorbs from overseas with the mindset that they could – at the very least – have some fun with their friends. As for the curious name of their business, Gu said she and Qian came up with the idea when they heard some students refer to Grand River Transit as “Geese Rapid Transit.” Since rapid sounds like rabbit, they decided to adopt the two animal names for their business. “It’s sort of an inside joke,” said Gu. Currently, Gu and Qian use their business to rent and sell zorbs, but they are working to create more bubble soccer leagues in KW and the GTA. They are also looking to import more inflatable products, such as a giant hamster zorb. Last year, the staff with Laurier’s LaunchPad program, which supports entrepreneurship, offered Gu and Qian valuable advice that helped them grow their business in the right direction. Gu also learned a lot from her experience with Laurier’s New Venture Competition presentations. Gu and Qian, who will be starting their third year of study in the fall, plan to continue growing their business, but also hope to start a non-profit off-campus student housing group in the near future.